Bangalore: Playtonia, India’s leading e-sports start-up organised the grand finale of Conqueror’s Insignia, a landmark event which was the culmination of numerous offline and online tournaments across 8 cities (Mumbai, Pune, Delhi, Chennai, Bengaluru, Kolkata, Cuttack and Hyderabad) and 4 months of gruelling competition. Some of the best professional gaming teams and gamers from India and abroad like Srilanka and Thailand participated with 16 teams each for CSGO, DoTA and 8 gamers for FIFA. They competed head on in front of more than 5000 crowd for a prize pool of 20 Lakhs at Phoenix Market city, Bangalore on 5th November 2017. 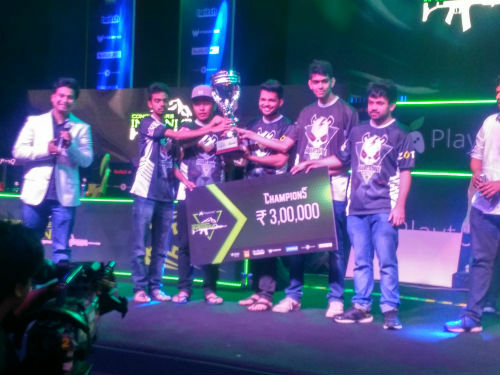 The winner of CSGO was Eternal eSports from Mumbai, DotA2 was Aggressive 5, FIFA’7 was Sudin Dinesh from Eternal eSports with Shanawaz Ahmed as Angemon securing the first position in Cosplay event. The whole city of Bangalore tuned to the spirit of e-sports with more than 5000 spectators in the venue. Not only that, the excitement spread worldwide with 10000 viewers watching the competition via Twitch. Today, more than 10 million Indian youth are involved in e-sports which target the age group of 18 to 35 years who are focused, deeply involved and spend long hours on the internet. The e-sports industry is booming with more than 350 mn sports enthusiasts in 152 countries who are spending more than five hours daily competing on various online and offline platforms. The Olympic Council of Asia included e-sports in the Asian Indoor Games in 2007 and the process has started to get e-sports recognized by the International Olympic Committee. Next articleOver 4000 children experience science like never before in Mumbai!